Skulls from the Morton Collection. Photo by Steven Minicola. 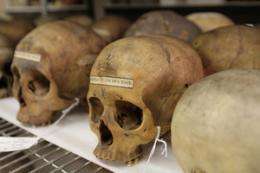 (PhysOrg.com) -- The scientific integrity of one 19th century Philadelphia scientist has been reaffirmedbut at the decided expense of a prominent late 20th century scientist who had discredited him. Such was the conclusion reached by a group of anthropologists working collaboratively to re-examine, and perform anew, scientific measurements on a famous collection of nearly 1,000 skulls from around the world, the "American Golgotha" collected and studied by Philadelphia physician Samuel George Morton (1799-1851). Today, much of the collection resides at the University of Pennsylvania Museum of Archaeology and Anthropology in Philadelphia, where members of the anthropology team performed their analyses. The team was responding to accusations made by Stephen Jay Gould (1941-2002), prominent evolutionary biologist and science historian, who charged, first in a 1978 Science paper and later in The Mismeasure of Man (1981), that Morton had selectively reported data, manipulated sample compositions, made analytical errors, and mismeasured skulls in order to support his prejudicial views on intelligence differences between human groups. In "The Mismeasure of Science: Stephen Jay Gould versus Samuel George Morton on Skulls and Bias" (a new paper, published June 7, 2011, in the online journal PLoS Biology), the six scholars agree that there was bias-but the bias came from Gould, who failed to examine, let alone remeasure, the crania to determine Morton's level of accuracy. Jason E. Lewis, lead author, Stanford University, Marc R. Meyer, Chaffey College (both formerly students at the University of Pennsylvania), David DeGusta, Stanford University, Janet M. Monge, Acting Curator and Keeper of the Physical Anthropology Collections, University of Pennsylvania Museum, Alan E. Mann, Princeton University (and Emeritus Curator, Physical Anthropology, University of Pennsylvania Museum), and Ralph L. Holloway, Columbia University, all contributed to the study. This study is just one of multiple projects carried out on the Morton Collection in the past decade. While alive, Morton was hailed as one of the earliest objectivists, employing a rigorous scientific method and carefully acquired data to arrive at his conclusions. As the decades went by, many of his ideas surrounding intelligence differences between human groups, and the concept of polygenesis (whereby different human populations were viewed as separate species hailing from multiple divine creations) were discredited, and his work went out of favor. It was not until Stephen Gould's accusations, however, that Morton's scientific methods were seriously questioned. The general discrediting of Morton's scientific methods has had wider ramifications, as Gould used Morton's alleged failure to argue that "unconscious manipulation of data may be a scientific norm" since "scientists are human beings rooted in cultural contexts, not automatons directed toward external truth" (Science 200: 503-59)a view that has achieved substantial support in social studies of science. Gould's "Mismeasure of Man" has been pretty thoroughly refuted by several people over the years. It' s a shame that it still gets quoted approvingly by some people who would prefer reality to be different than it is. It seems as though those who hold themselves out as popular scientific authorities (Martin Gardner, Daniel Dennett, Richard Dawkins, Jared Damond, James Randi, Carl Sagan, etc.) often crusade for unsupported points of view even when they should know better. Still, Gould had a great style of science writing and was always a pleasure to read. It's good to hear Dr. Morton has been vindicated. Cyril Burt, another great scientist vilified by Gould also turned out to be both blameless and right.